There is always more to solving the problem than we think, and the human resource aspect of intellectual property strategy is a critical component of building a strategy that companies can’t afford to ignore. An IP strategy specific to a company is not something that can be digested into an easy soundbite without knowing all the details and the business environment. More specifically, when asked about the best strategy to pursue there is so many variables that the reply – like any good strategy – needs to take into account the environment it is both build it, and created to exist in. This translates me repositioning the question I am asked “Can I patent this?” to “Should you patent that, what is the scope of the business you need use the IP for, and will your current scope help you?” Is the patent part of a defensive strategy, or licensing program you are hoping to build? Are you key competitors already in this technology space, or is it a blue-ocean you are planning for?” There is 100 more questions I could ask a venture that will help narrow in on the best strategy for that venture based on the business environment they are playing in. However, there is one consistent piece of an IP strategy that transcends all types of ventures, and growth plans they have: People. And it is not enough to have “a team member who knows about IP” as part of your strategy to have IP as a competitive advantage in your venture. Startups and smaller ventures need to have staff that are masters of many topics, but in reality for IP it is a strategic skill set that is often not available internally. This translates into the need to have outside counsel that is not only versed in the legal side of IP, and also with business experience in the industry to help guide the work being done. As a cautionary note, simply outsourcing IP to an attorney with the hope that they will guide the strategy is often a plan I hear startups talk about, but in practice does not always generate the portfolios needed for the future venture. For other more savvy startups, they opt to have a strong advisory board or board member that has the background to keep the venture and external counsel on track. Larger firms need to realize their end goals of having an internal IP team, and see if the core competencies required exist in the team or if it should be outsourced. For ventures with an existing team who have been building a patent portfolio, the question I would ask is as follows: “Is the team that build it also versed in setting the appropriate business strategy? Or are they just a team build to execute?”. There are larger ventures who have been staffed with an IP team before the vision is set, so while execution of a program happens it may not be execution of the best program for the venture. Jim Collins, author of Good to Great, talks about the “First Who, Then What”, which elaborates on how the right people can be the most important asset, but the destination of a successful venture is defined by the WHO you have on board, leading to WHAT they will accomplish. Building and executing an IP program or strategy is no different – you have to have the right people. If you have stacked your venture with skills in executing and prosecuting IP, your ultimate portfolio will largely be defined by patents that were generated and prosecuted efficiently, yet the ultimate scope and view may have no defined strategic position. For smaller ventures I would ask: Do you have a mentor team, advisory board, or board member that has the skills to help strategically position your IP? While these individuals may not do the work they can steer smaller groups with restricted budgets to spend their efforts and filings costs in the best areas. Do you have the WHO to get you where you need to be in order to have a protected competitive advantage in the market? For medium and growing ventures I would ask: Do you have a team built to execute, and are you actively making time with your executive teams to ensure you are providing them guidance? Measuring a team on patent volume as the metric of progress needs to be supported by a measure of quality and scope as well. For larger ventures with established teams I would ask: Do you have the leadership in both the businesses and IP groups to set the strategy that needs executed? Is the IP position part of the strategic planning cycle, and are KPIs in place to drive the right behavior for the IP team? In summary, a tangible take-away for ventures is to really think about the HR aspect of your patent plans. Having the right people to define the strategic view on your team will be a key success factor in your final portfolio position, regardless of venture size. 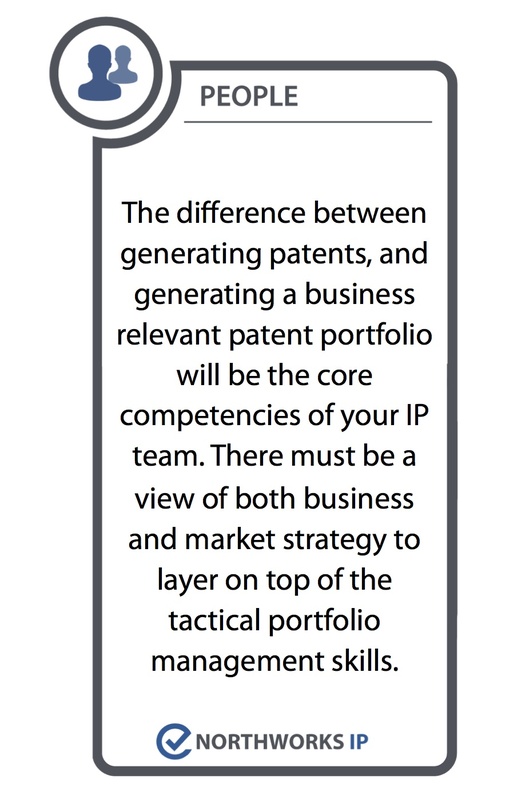 I really like the way you described knowledge of IP as key part of your team or company. I particularly like the point you made about how it is not enough to have just one person who knows about IP. I agree that you need a team that is well versed in the law and technical aspects as well as the business aspects. If you don’t have a team like this, I’m sure there are patent consultants that would be happy to work for your company.